We tend to think that gallantry is as antiquated as the idea of chivalry. The idea of knights galloping on their white stallions, dressed in vestments of armor, loyal to his God, his lord, and to his lady, is a romantic notion to the adventurous man but does’t seem to mesh with modern culture. 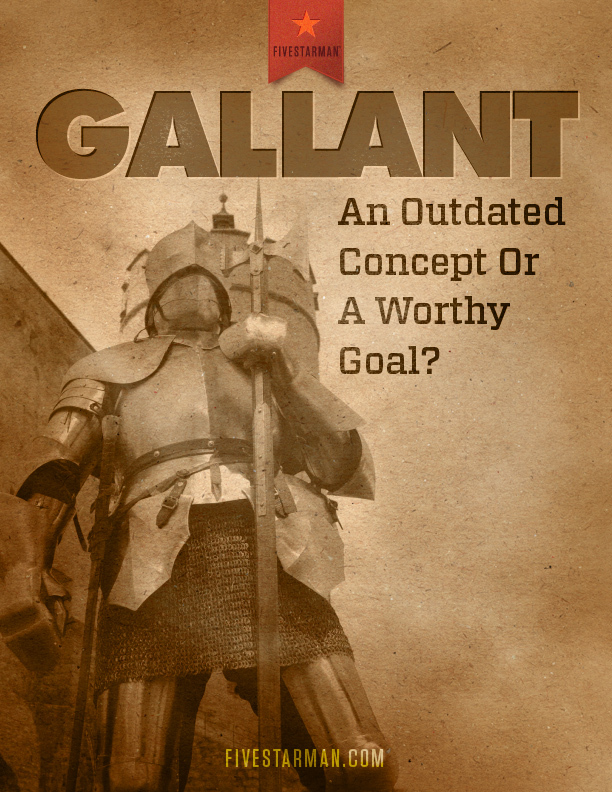 Gallant is an old word, archaic in most vocabularies, yet FivestarMan uses it to describe the ideal of authentic manhood and is one of the five passions we clearly define as a worthy and attainable FivestarMan goal. To be gallant means to show special attention and respect toward women in an honorable way. It means that we look to women who are older than us as our own mother. We look at women who are younger than us as our own daughters. We look at our peers as our own sisters. And the only woman who receives the intimacy of our eyes and the passion of our loins is our wife. The biblical character, Job, said he made a covenant with his eyes that he would not look upon the young lady, meaning he would not undress a girl with his eyes. You often hear that it doesn’t hurt to look. Really? You don’t really believe that do you? Think of it like this: If you were to see a man staring your wife up and down what would you do? If you saw a man gazing upon your young daughter what would you do? Don’t gaze upon women. Doing so makes you look silly and sophomoric. You’re not a juvenile. You’re a man! Have some dignity about yourself. Learn to bounce your eyes. When a woman walks into view learn to look another direction. I know, right now, you’re thinking that I’m being legalistic — but in reality, I am not. Just as Job understood, we need to realize there is a connection between how we look upon a woman and how faithful our relationship with our wife will be nurtured. Amazingly, Jesus equated looking upon a woman as committing the physical act of adultery. That’s a harsh reality in our culture when you can’t watch a simple hamburger commercial without a brazen woman eating it seductively. I know this is a standard well above the norm of society. I know that being a FivestarMan is a lofty ideal. However, if we want the rewards of living like a champion, we will need to conduct ourselves like champions. Stand up to greet her. Keep at least two arms distance from her. Do not use crass language. Do not speak with harsh tones. Do not flirt with her. Do not communicate with her outside of proper protocols. Being gallant is most certainly a worthy and attainable goal. If you want to step up to the standard of being a FivestarMan, take the 45-Day Challenge. Thousands of men are and I expect that you can achieve it also.